Some bingo events are worthy of special attention due to the size of the jackpot prizes offered. Those special games will be posted right here! Grab your tickets and start your weekend with a major win! The action begins on 2nd October from 18:00 UK Time in the "A Night on the Town" room. Buy your tickets from just 5p and go for prizes up to £1,000 in 75 Ball games including 1TG & 2TG, BOGOF and Last Chance Saloon. See the bingo lobby tonight for the full schedule. Players will be notified prior to the game whether Roll On, 1TG, 2TG or Last Chance Saloon Scratchcard prizes will be credited to their Withdrawable cash balance or Bonus balance. Where winnings are credited to a player’s Bonus balance, the amount of the bonus will need to be wagered four times on Bingo before becoming withdrawable. Take part by entering The Living Room between 12pm – 3pm. They've got a guaranteed £10,000 to give away EVERY DAY starting with the daily £2,000 Bingo Linx at 12pm. Then every half an hour there will be another big money game. There will be plenty of 1TG, 2TG and 1&2TG, Roll on Bingo and Last Chance Saloon games. They’re giving out big wins for less with the £30k Value Night! The fun begins at 6pm in the Gold Rush room and will continue till midnight. All of these games boast brilliant discount tickets that cost just 5p or less. At 6pm and 10.30pm they will also feature Bingo Linx games with big prizes for just 10p a ticket! CyberBingo and sister sites Bingo Fest and Bingo Sky. Saturday October 24th it is United Nations Day and they have prepared a United Nations Day Big Bingo Event which will be played on CyberBingo, BingoSKY and BingoFest. Players will play for incredible guaranteed cash prizes including $10,000 in the big game. Playing in the Bingo tourney room from 8:00PM EDT on Saturday, October 24 EDT, there are $13,000 in guaranteed cash prizes that must be won. The fun starts with three (3) top of the hour warm up games offering a guaranteed cash prize of $1,000 to be won for a card cost of just $2.50 each. The big game takes place at 11:00PM EDT with a guaranteed cash prize of $10,000 with cards on sale for $5 each. Cards for the Big Bingo event can be pre-ordered even if players cannot make it to the event. This can be done from pc, tablet and even from a mobile phone. Win big prizes from 30th October until 1st November in the Guilty Pleasures room, where tickets will be available from 1p to 50p and prizes rise to £3,000. The room is open until 23:59 UK Time each night with 10 games running every hour, including Party Bingo, Grab a Grand, BOGOF and many more. See the site for game schedules. Set a reminder to take part in the £13,000 Firework Fun Special Game at the end of the month. The game is scheduled for 9:45pm on Friday 27th November with tickets on sale for 50p. There have a huge jackpot game with the £1,000,000 Self-Made Millionaire JP, which plays the 3rd Saturday of every month @10pm. You could be the next to become a millionaire so mark your calendars and see the site for more info and T&C's. 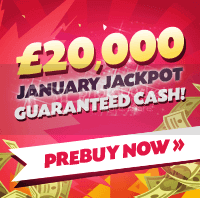 Win £20,000 cash with January Jackpots! Take part in The Big £10k, which is scheduled for the 10th of every month. The promotion is available to depositing players. Win a share of a £5k jackpot split between 1 line, 2 lines, Full House, 1tg and 2tg. Everyone splits the remaining £5k. The game plays at 8pm on the 10th of every month. See the site for more details and ways to earn free tickets. Everyone that purchases a ticket for £200,000 Jumbo Jackpot is guaranteed to win. The more tickets you buy, the higher your share will be!. Everyone Else: £100,000 will be shared amongst all other ticket holders, according to the amount of tickets bought per player, so every ticket counts! $50,000 Coverall minimum $10,000 Strike it Rich event takes place on Saturday, January 30th. This Big Bingo begins at 8:00PM EST on Saturday, January 30th in the Tourney bingo room and starts with three incredible $1,000 guaranteed top of the hour games with cards on sale for $2.50 each. Three games will play at 8:00PM EST, 9:00PM EST and 10:00PM EST and offer $3,000 in guaranteed cash prizes before the big game. The $50,000 Coverall minimum $10,000 Strike it Rich game will play at 11:00PM EST with cards on sale for $5 each. You'll have the chance to win up to $50,000. Pre-buy available. Games also available at Bingo Fest and Bingo Sky. This is a really exciting game! Be ready to win big on Saturday 27 February at 8pm! All prizes will be awarded in CASH! The Big Bingo Event is their biggest Monthly special which plays in the Bingo Tourney Room; where players are guaranteed some fantastic prizes. In the month of March, the Big Bingo Event will consist of the following games playing as Top of the Hour Games starting at 8:00PM ET. Enter the bingo90 room from 4th - 8th April for a chance to win £5,000 every hour on the hour. End April on a high note with £1 million in prizes. Play any bingo game at all this weekend and take home a share of this massive prize pot. Play now before the weekend’s out!